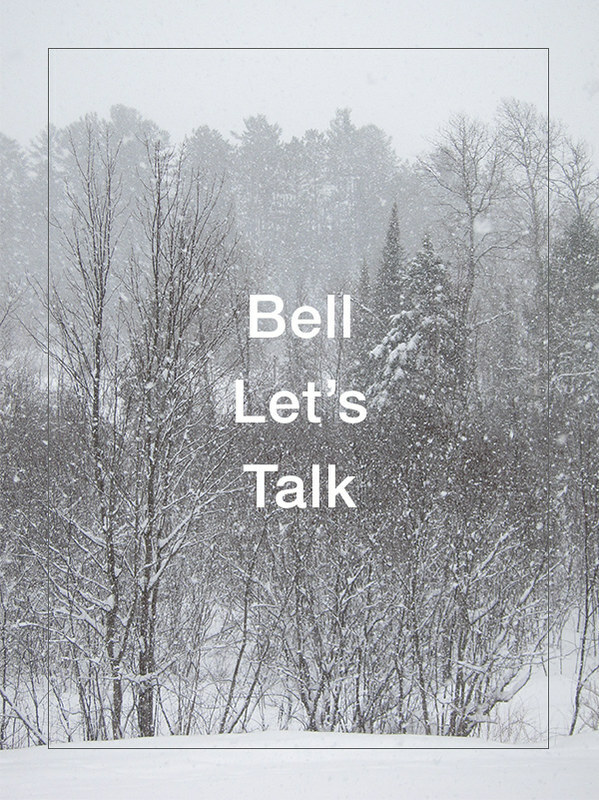 Today in Canada it’s Bell Let’s Talk day, it’s a day to discuss and bring awareness to mental health and the stigma that comes with people struggling. I am one of those people, since I was a teenager I have had bouts of depression that have followed me into adulthood. I’m hoping that by sharing my story that it will help others to shed the shame associated with depression and other mental illness, so they can get the help they need. You are not alone, we are in this together. I am an open book, ask people who know me, I’m a sharer. I don’t hesitate if someone I know is dealing with mental health problems, in fact I’ll jump right into action to offer advice, an ear to listen or just give a big hug. If you need a shoulder I am your person, BUT when it comes to dealing with my own struggles with depression I have a very difficult time sharing and asking for help. It’s the loss of control and the shame that follows me around whenever depression hits and that causes me to shut down, go down the rabbit hole and isolate myself. It’s easy for me to get lost in my darkness and become worse. It can be even harder pulling myself out of it because to me depression feels familiar and although it is painful I sometimes can’t pull away from it, it’s like an old friend visiting again. Depression for me is sitting around feeling sorry and being hard myself, it’s thinking the worst about almost everything and it’s assuming it will never get better. It’s isolating because no one wants to be around me and I don’t want to be around them because I’m afraid of how I’ll appear and I’m prone to speaking negatively. That’s why we need to bring more awareness and help lift the stigma that makes me feel it’s my fault that I can’t snap out of my crappy mood, it’s so much more than just a bad mood, it’s a complete way of negatively thinking about myself and the world around me. It’s an illness that requires my attention and care; daily. So what do I do to protect myself from the cloud of depression? I have to take care of myself, it’s regular self care routines that keep my mind and body healthy. I thought sharing what I do might help someone else out there struggling. These are things I do fairly regularly but I also recommend seeking a professional if you are in a really bad place, for example it’s starting to affect your concentration at work, your sleep, your relationships or definitely if you are thinking of hurting yourself. What worked for me is going to my family doctor, not to discuss my depression but to just a get a referral to a counsellor. Unfortunately in my experience family doctors aren’t equipped to help out too much and trying to talk to mine just resulted in me going home feeling discouraged because she only had 10 minutes and minimal skills to offer as help. I practice yoga a couple times a week and I find it helps me destress and slow down the chatter in my head. Exercise helps with keeping serotonin & good hormone levels up and adrenaline & stress hormones levels lower (which make dealing with stress much more difficult). I do morning and sometimes evening meditations (not everyday but I’m working making it a daily habit), it’s 15-20 minutes of focusing on breathing and releasing thoughts to help slow down my mind chatter. I use an app called Calm, which is expensive but for me it works and I use it. Calm has both guided and unguided meditations with different categories to chose from such as Focus, Body Scans, Loving-Kindness, Forgiveness, Walking Meditation, Sleeping, etc. I love the variety of meditations so I can tailor it my moods and needs. I’ve been using my Phillips goLite Blue for several years now as a way to combat the winter blues. Seasonal Affective Disorder is caused in the fall and winter months when we don’t get enough sunshine. Light therapy helps with my energy levels and I use it every morning, including when I worked in an office. I explained to my co-workers that it helped with my mood and energy levels which makes me better abled to do my job well. Sometimes if I’m feeling down or my thoughts are getting the best of me a good walk outside will do wonders. I especially feel good after a walk in the forest, being in nature and not around the busy city noise helps clear my mind and bring perspective to what’s going on. Focusing on breathing also calms me down and is especially important for me if I’m feeling anxious or stressed, it will lower all those Fight & Flight chemicals that are in my body. As a part of Bell Let’s Talk Day it is important to get on social media to promote the cause. Bell donates money for every text, tweet, Facebook post, etc. Go to Bell Let’s Talk for more information on what you can do to raise money and to get involved in bringing awareness to mental health issues. Sharing helps too Bravo to you for doing that. Hugs! Beautifully, and bravely written. I too find it hard to reach out for help at times, even when I know I need it. Fear will rob you of your life if you let it. Love and miss you guys!